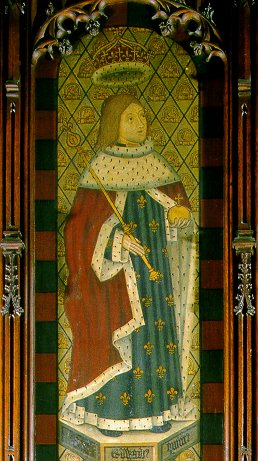 Edward V was the eldest son of Edward IV, and his queen Elizabeth, was born in the Sanctuary at Westminster, November 4th, 1470. He was created Prince of Wales and Earl of Ludlow and succeeded his father, April 9th, 1483. He was at the time at Ludlow, and while on his way to London, under the care of his uncle Anthony Woodville, Earl Rivers, fell into the hands of Richard, Duke of Gloucester, who placed him in the Tower. There he was joined by his brother the Duke of York. Meanwhile Richard was named Protector and fixed the day for the coronation of Edward, which however never took place. Richard assumed the crown on June 26th and the two young princes were seen no more. According to the account given very minutely and confidently by Sir Thomas More, they were murdered in the Tower by order of Richard III, who employed Sir James Tyrrel to do the foul deed, and were buried under a heap of stones at the stair-foot. Tyrrel and his agents are said to have subsequently confessed the deed. And the discovery, in 1674, of bones, every way answering to those of the princes, at the foot of a staircase in the White Tower gives strange confirmation to this account. The bones were removed by order of Charles II to Westminster Abbey, where they now rest. NOTE: The coinage of Edward V is not readily distinguishable from that of his father Edward IV. It is believed that the mint mark of a halved sun and rose was most likely introduced during the last year of his father’s reign. Given the brief time period of his reign, we cannot be certain as to the coinage struck during this time period.